(Nanowerk Spotlight) Sensory substitution with flexible electronics is one of the intriguing fields of research that takes place in nanotechnology labs around the world. Scientists already fabricate electronic devices that can replicate, to some degree, some of the human senses, such as touch (electronic skin – e-skin), smell (e-nose), and taste (e-tongue). In line with this focus on human senses, in the future artificial retinas integrated with the human body may not only repair damaged vision but also expand it to see a wider range wavelengths (e.g. ultraviolet light). The human retina is a film-shaped tissue behind the vitreous body in the eye. Photosensitive cells in the retina convert incoming light energy into bioelectric signals that are carried to the brain by the optic nerve. Researchers in China now have demonstrated a new self-powered brain-linked vision electronic skin (e-skin) for mimicking the human retina. "The general idea of our device design of brain-linked vision electronic skin is constructing an integrated flexible system including photodetector array, information analyzer, signal transmitter, and electricity power unit," Xinyu Xue, a professor at the College of Sciences at Northeastern University, Shenyang, tells Nanowerk. "While various research groups already have reported flexible photo detecting electronics, a battery-free, flexible and efficient power-supply unit remains an important bottleneck of the flexible vision e-skin. Another problem is to input the photo detecting signal into the brain for participating in the vision perception and relevant behavior intervention." "Our self-powered vision e-skin is different from traditional complex integrated systems and combines the electricity-generating, photo-detecting, and neurobionics of signal transmission into one single chemical/physical process," explains Xue. "In this process, the photo detecting units in the e-skin harvest human-motion energy and output triboelectric signals containing the photo detecting information, acting as both the power source and the photo detecting signal for mimicking vision." A novelty in this work is that the triboelectric and photo detecting effects are coupled in one single process. 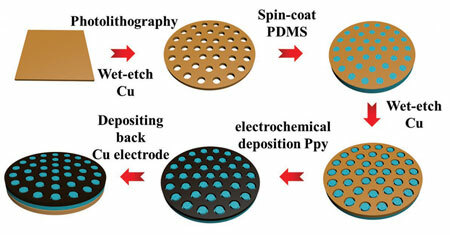 The team's novel fabrication process employs, in successive order: standard photolithography; printed circuit board technique; PDMS soft-template method; electron beam evaporation process; and electrochemical polymerization. The resulting film device is a polypyrrole/polydimethysiloxane (Ppy/PDMS) triboelectric photo detecting pixel-addressable matrix. "Our new fabrication technique can lower the production cost of traditional complex sensory-substitution systems and can be easily extended to various brain–machine interaction applications," Xue points out. To demonstrate the workings of their self-powered vision e-skin, the scientists attached it to the corner of a person's eye. The motion of blinking eyes generated enough output power of the triboelectric generator to power the device and, in this test setting, detect UV illumination. "The e-skin can map single-point and multi-point illumination stimuli (visual-image recognition) via the multichannel data acquisition method," says Xue. "In the next stages of our work, we will investigate self-powered multi-perception e-skin, including tactility, gustation, olfaction and audition. And we will also try to further investigate the brain-device interaction for practical purposes."